WWBPA trustees and members participated in a 500-mile ride from Charlottesville, VA to Quaker Bridge Mall this year to raise money for the Anchor House shelter for runaway teens in Trenton. In total, the ride attracted pledges of over $400,000. Thank you to everyone who donated, and if you’d like to donate, click here. WWBPA participants included Jerry Foster, Ken Carlson, Newell Benedict, Ken Naglak, DJ Varner, Jack Hayon, Ron Weinstein, Bill Garrett and Henry and Eileen Murphy, among other West Windsor residents. With about 200 participants, it’s great fun for a great cause. We’re already looking forward to next year! 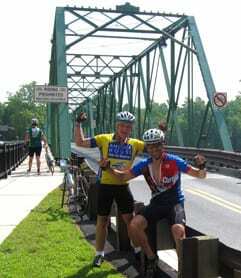 For more pictures and a day-by-day account of the ride, read Ken Carlson’s blog.